The hurricanes of 2017 were unprecedented, with wide-ranging effects across the United States. PESA Human Resources and Health & Safety Committees jointly hosted a roundtable discussion about managing through a natural disaster on February 28 at National Oilwell Varco. Panelists discussed the challenges faced by employers and best practices to implement moving forward from HR, safety, security, and workforce engagement perspectives. Jason Kuntz, Director – Systems QHSE & Quality Improvement, FairfieldNodal; Bob Bernazal, Director of Security, National Oilwell Varco; Holly Kriendler, Vice President, Human Resources, Oceaneering; Jock Pool, Director of Compliance, Oceaneering; and Roland Martinez, Human Resources Director, TechnipFMC served on the panel, which was moderated by Dave Warnick, VP Human Resources, Weir Oil & Gas. 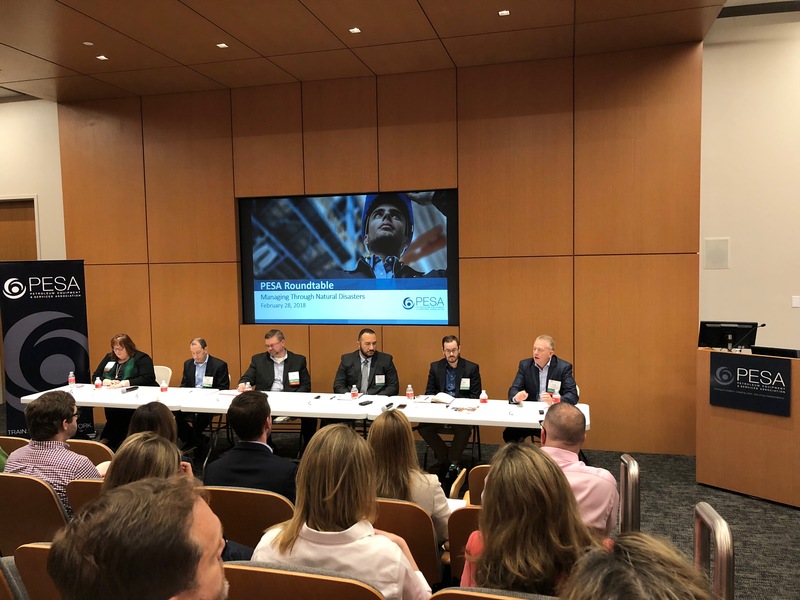 The panel discussion began with each panelist sharing their company’s experience during natural disasters such as Hurricane Harvey, Hurricane Ike and the Tax Day floods. Business continuity, staff support, post-event recovery, action plans, as well as crisis communication tools were discussed. Bernazal highlighted NOV’s Global Security Operations Center (GSOC), a communications tool particularly for evacuees and those without power. He also shared a lesson learned – having good data is critical, so employees can receive instructions. “We need to be able to respond to all levels of the organization and be able to make contact through employees in various methods,” Bernazal said. Kuntz addressed the importance of a post-event review. “Experiences like these open your eyes to the ‘what-ifs,’ which can then lead to plan modification, system innovation, and improvements in response efforts,” he said. A common theme discussed throughout the session was the importance of having a comprehensive crisis management plan in place. This includes preparing for a possible natural disaster, as well as what companies should anticipate post crisis. “One key lesson learned was to prepare resources for crisis management team members to transition back to work,” Kriendler said. Many companies agreed that transitioning affected employees back to work was a critical challenge faced, and shared additional key takeaways and suggestions with the rest of the group. Several panelists also agreed that a key take-away from the event was how volunteer efforts can assist in post-event recovery, and simultaneously pose a challenge. “The company’s response was impressive and the employees’ response to help other employees recover was incredible. Moving forward, we will anticipate our employees’ desire to volunteer to help others recover. In order to most effectively mobilize our workforce, we will be better prepared and organized for future natural disasters,” Pool said. Other members expressed the significant HR and safety challenges involved in mobilizing a volunteer workforce to assist others. Some members used their own PPE, while others outsourced the equipment. Another key takeaway was to ensure employee personal information is regularly updated, and all employees are aware of the company communication plan. In the event of an emergency or natural disaster, delivering and receiving messages effectively to all levels of the company is paramount. “One of the most significant lessons learned was about data. Once information comes in, it needs to be transferred to all employees. Data needs to be effectively analyzed for protocols to be quickly established and development of response and support teams can be executed,” Martinez said. Member companies shared their experiences with internal communication efforts used to acquire the data. Overall, the speakers agreed that while no one can predict natural disasters, it is critical to maintain current data on your workforce and redundant systems that enable real-time communication with employees. Workforce mobilization and crisis communication plans will only be as valuable as your ability to connect with personnel. The PESA Human Resources Committee holds bimonthly roundtable events educating PESA member companies on the various trends, challenges,and solutions affecting global and domestic HR departments. The roundtables encourage open dialogue, connecting PESA members to discuss topics including workforce planning, benefits, competency management, shared services and global mobility. All PESA committees manage a range of programs designed to train, elevate, and network sector professionals and collective member companies. Active engagement with a PESA committee is an opportunity for professionals at all levels and their companies to show leadership, network with other industry leaders and gain recognition for helping improve the industry. To get involved in a committee, contact PESA Vice President Communications and Member Relations Molly Determan. For more information on upcoming PESA events, please visit the Event Calendar.